The AC chair sent me a follow-up message after the meeting offering support for all of the proposals I had laid out at the meeting — except restoration of Warren Falls itself. While that last part was disappointing, it was helpful to at least have a sense of where the AC stood on the issue, since I can now focus efforts on finding the needed funding and perhaps a project partner for ODOT to pull off the Warren Falls restoration. 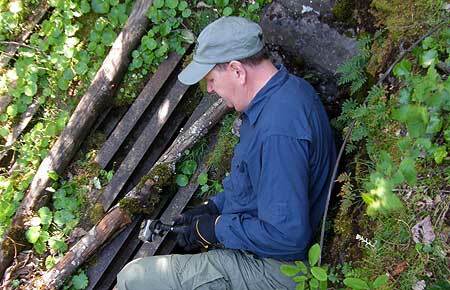 • removal of invasive species in the area – mostly, English ivy, Himalayan blackberry and Scots broom. So, despite the disappointment of not adding the falls restoration to the current ODOT project, the list of related restoration work supported by the AC is a big step forward. In their words, the AC is “supportive of [the] idea to bring water back to the original waterfall, but given our charge, we cannot offer any monetary or construction assistance”. 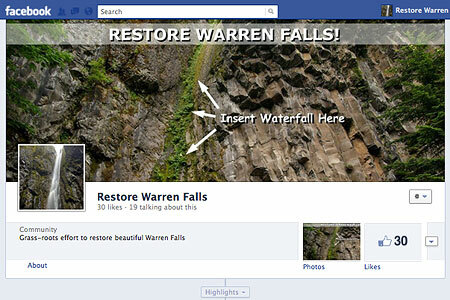 A partial victory, to be sure, but also a challenge to help ODOT find funding for the Warren Falls restoration. This historic streambed of Warren Creek, now permanently cut off from the stream, could have a “bridge-like” crossing and an interpretive sign describing the area history. An interesting footnote to the meeting was a conversation I had afterward with a reader of this blog who had watched the presentation, and thought a much simpler solution was possible for restoring Warren Falls: simply pull out the “trash rack” grate, and let Warren Creek do the rest. 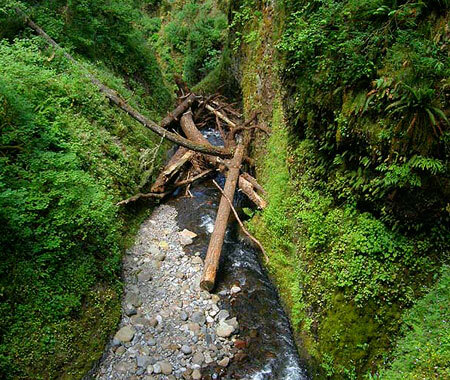 The stream would surely plug the tunnel with debris and gradually start flowing over its original falls without an elaborate engineering solution for retiring the tunnel. It’s a temptingly simple idea, and came from a person with a professional background as a hydrologist, no less. 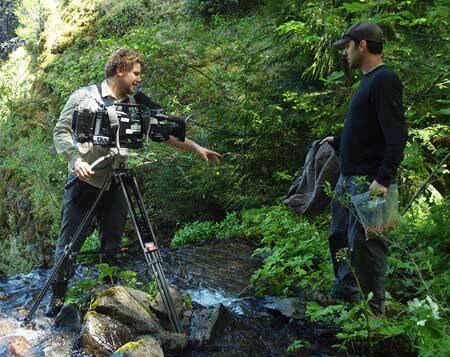 So, that scaled-back option will be my starting point as I look for additional funding for bringing back Warren Falls. After the HCRH Advisory Committee presentation, I bolted for the Starvation Creek trailhead, with a strong hunch that Warren Falls would be flowing that day. 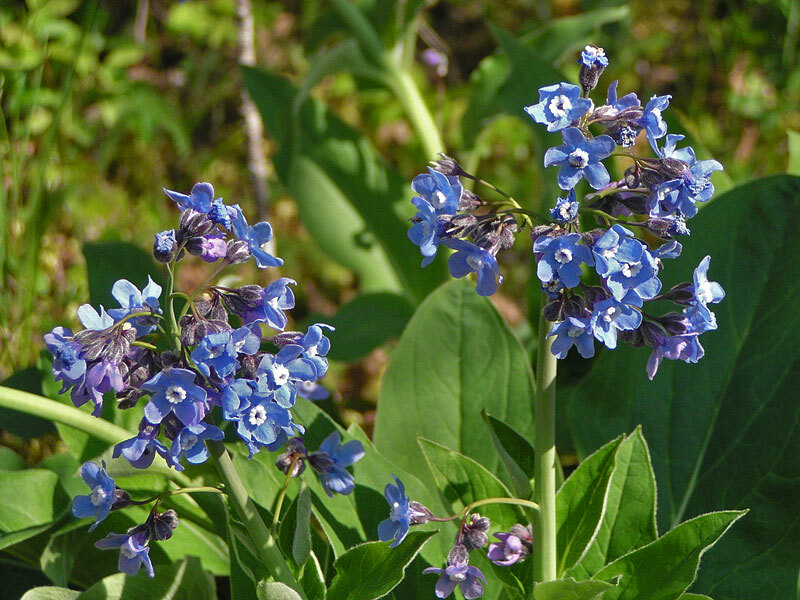 Despite the bright, blue skies on March 16, the previous week had seen an unusually cold and wet weather pattern, and the gorge waterfalls visible from the highway were roaring. As hoped, when I arrived at Hole-in-the-Wall Falls, part of Warren Creek was flowing down the normally dry channel that leads to Warren Falls. I captured the following video as I walked along the temporary stream, then rounded a corner to find water flowing over Warren Falls, once again. Warren Falls lives! 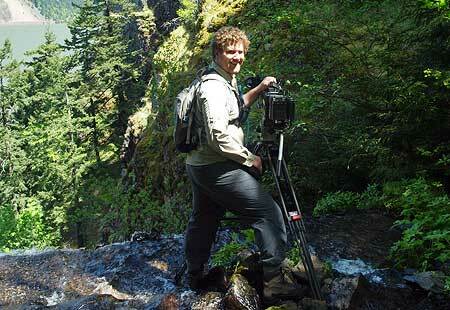 As with previous visits when Warren Falls was flowing, the experience was magical. Instead of hearing the echoes of trucks on I-84 in the dry amphitheater surrounding the falls, I could hear only the sound of Warren Creek — or the overflowing part of it, at least — cascading over the 120-foot brink of the falls, then splashing down the normally dry streambed to the point where it re-joins the main stream of Warren Creek, at Hole-in-the-Wall Falls. 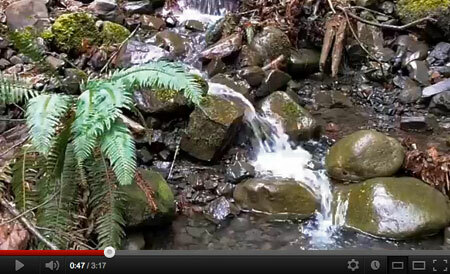 This clip marks the moment when a large rock came over the falls, in the background… CRACK! The video still image, above, marks a somewhat jarring moment on this visit, however: if you listen closely at 0:47 you can hear a CRACK! in the background, then an abrupt end to that clip in the video. This is the sound of a soccer ball-sized rock coming over the top of the falls — just as designed — and landing in the debris pile near the base. It was not only startling to hear this, but also a bit ominous, considering that on previous visits I had been standing at the base of the falls shooting video and still photos. 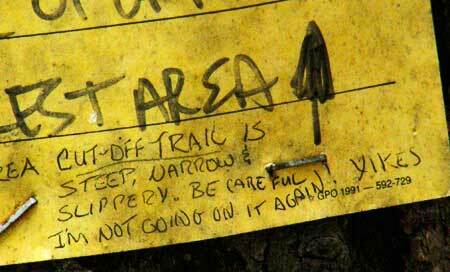 If you visit when Warren Falls is flowing, please don’t stand near the base of the falls! Finally, there was a pleasant surprise on the way out that day. 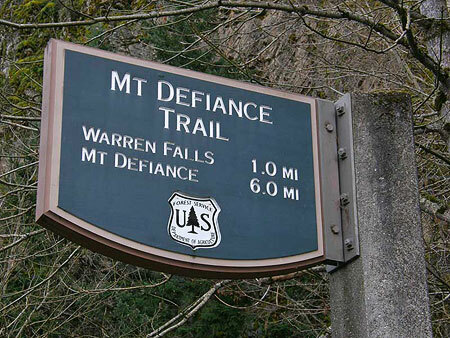 For some reason I had never noticed, but the USFS trailhead sign at Starvation Creek (pictured at the top of this article) actually lists Warren Falls as a destination! Clearly, the Forest Service meant Hole-in-the-Wall Falls, but I choose to look upon the sign as a good omen that the real Warren Falls will be restored! My month of Warren Falls adventures continued on March 25, when I guided a Friends of the Gorge hike on a tour of the Starvation-area waterfalls, including a visit to Warren Falls. 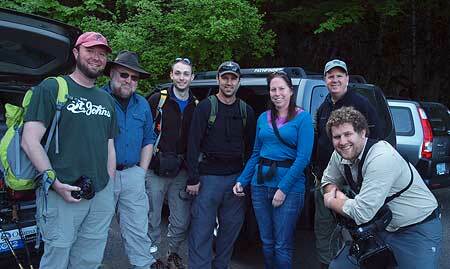 At 24 hikers, the group was by far the largest I have led to the falls site! 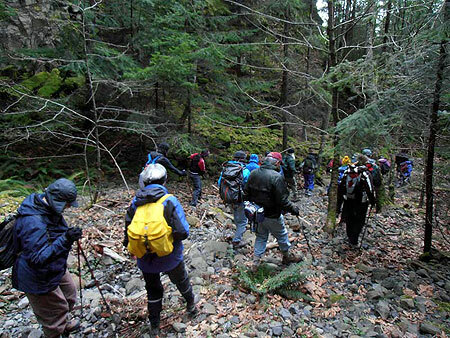 Warren Falls was once again dry on this visit, but the group was fascinated by the odd history of the diversion project, the obvious signs that Warren Falls had recently flowed, and the magnificence of the massive basalt amphitheater that frames the falls. You can help out by stopping by the Facebook page, like it, and then forward the web link to like-minded friends. If the project picks up enough “likes”, it will help me make the case to ODOT and elected officials that popular support exists for the project. Thanks go out to those who have already stopped by the Facebook page, and thanks, especially, to Scott Cook for speaking out in support of Warren Falls at both HCRH Advisory Committee meetings — very much appreciated, Scott! 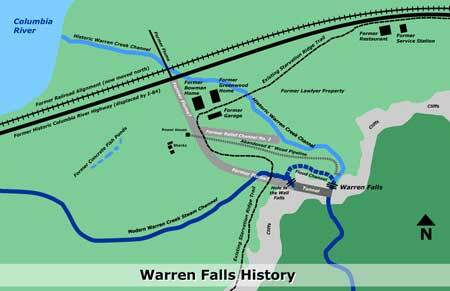 Please watch the Warren Falls page on Facebook for more updates on the project as the it unfolds over the next several months. 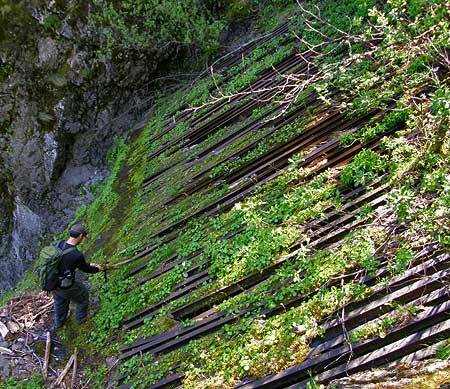 The strange history of Warren Falls began shortly after completion of the Historic Columbia River Highway in the 1920s, when unruly Warren Creek repeatedly pushed debris against the modest new highway bridge that spanned the stream. 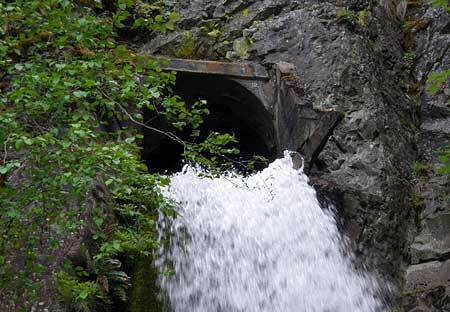 Oregon highway engineers subsequently diverted the creek in 1939 through a bizarre tunnel that survives to this day. The diversion created today’s manmade Hole-in-the-Wall Falls when an accompanying flume was removed sometime in the early 1960s, leaving an eerie, dry cliff where Warren Falls once thundered. 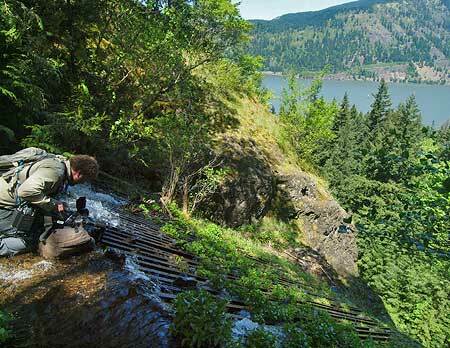 This article proposes a few solutions for restoring Warren Falls to its former glory in tandem with the ongoing ODOT project to restore the Historic Columbia River Highway. 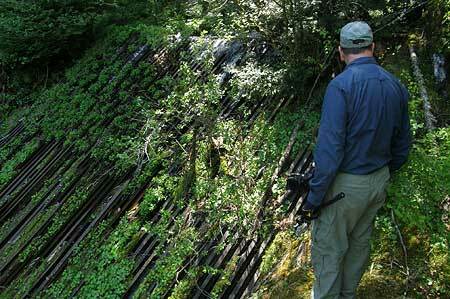 The simplest solution for restoring Warren Falls is to simply wait for the “trash rack” diversion structure to rust away, eventually collapsing into the tunnel intake under the weight of a heavy winter flood or debris flow. Surprisingly, this hasn’t already happened over the 73-year life of the diversion project, but it is inevitable. This is the least desirable option because it leaves the maintenance and safety liability of the diversion tunnel in ODOT’s hands, and the removal of obsolete structures to chance. 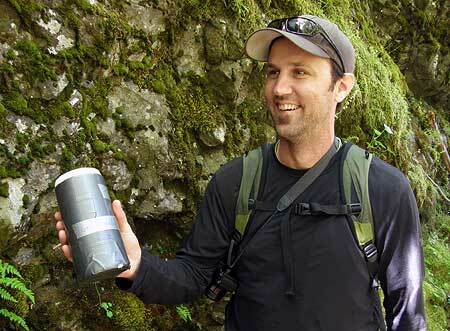 The dry falls and diversion tunnel are visited regularly by curious hikers, canyoneers and rock climbers, so the unresolved safety liability the tunnel presents for ODOT is quite real. Short of waiting for the “trash rack” diversion structure to collapse on its own, the simplest option for restoring Warren Falls is to cork the tunnel intake. A vault carved like a rocky bathtub into the bedrock brink of the falls forms the tunnel intake, and provides for the “cork” solution. Though the metal “trash rack” covers an opening of roughly 20×20 feet square, the rock vault is tapered in a v-shape, narrowing to the 5 foot width of the tunnel at the bottom of the vault. The “cork” would be a series of stacked basalt columns filling the vault and blocking the bypass tunnel opening. 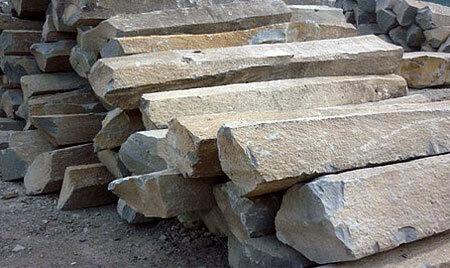 Approximately twenty 6-foot columns, each about 18 inches in diameter would do the job. 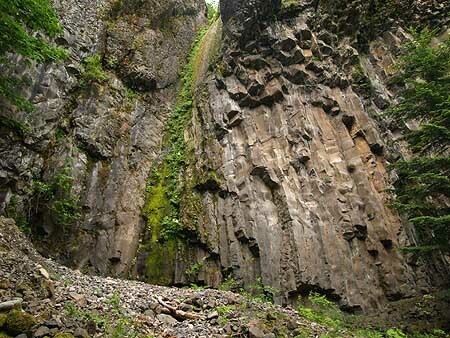 Mother Nature would provide the assist for this solution once the basalt columns are in place, with the hydraulic force of Warren Creek filling the spaces between columns with fine gravels and sediment over time. Eventually, the voids between the columns would fill completely, plugging the bypass tunnel to all but a small amount of seepage. 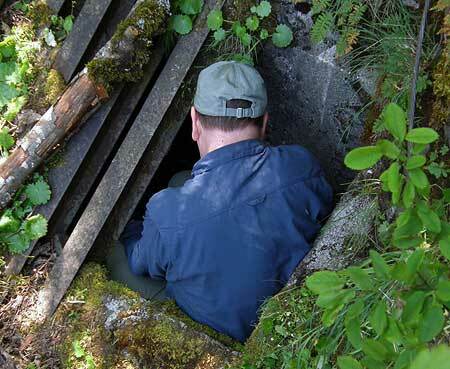 The lower end of the corked bypass tunnel would also be covered with a protective grate to prevent curious explorers from entering, just as a number of lava tubes in Oregon have been gated to public access. The bonus? A very large, secured bat cave is created in the process! How would the basalt columns get up there? 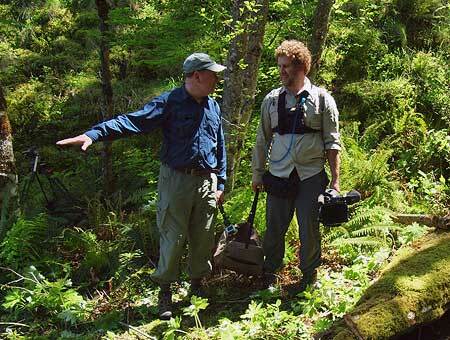 The best plan would be an air crane, as the rock columns would be comparable in size and weight to the timber loads that are routinely lifted in Oregon’s helicopter logging operations. ODOT maintains an open maintenance field just a few hundred yards from the falls site, with direct freeway access for delivering the columns to a staging area. 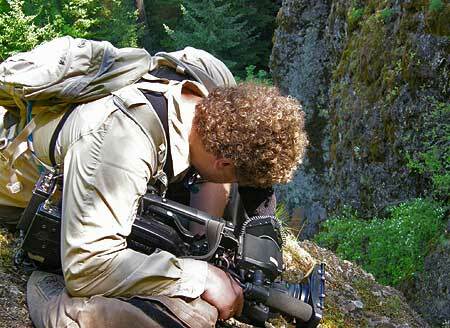 On-the-ground workers could access the top of the falls from the Starvation Ridge Trail, but a mechanical lift from the base of the falls would be more practical. 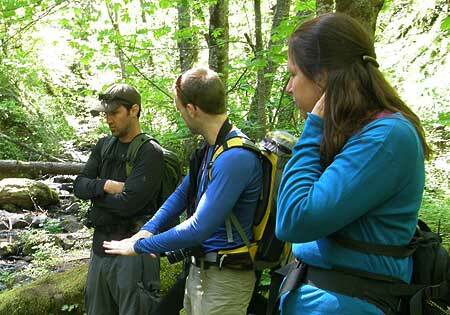 The third option is the best plan for fully restoring Warren Falls to near-natural conditions. This design would “fill the cavity” of the entire bypass tunnel, permanently. This solution uses the original masonry dam at the head of the bypass tunnel to temporarily pipe Warren Creek over the natural falls during the construction phase, allowing for concrete work to proceed within the bypass tunnel. The tunnel would be plugged in two steps. 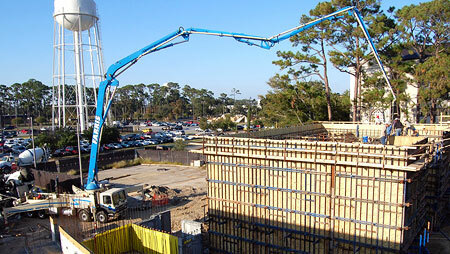 First, a reinforced concrete plug would be poured at the lower opening of the bypass tunnel, sealing the tunnel exit. The plug would be disguised on the outside to match the color and texture of the basalt cliff. 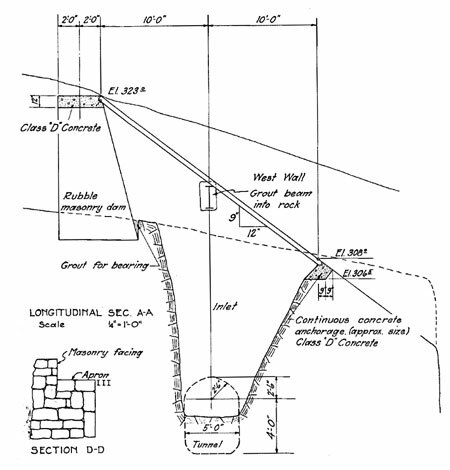 Next, the rest of the tunnel would be filled with mixture of concrete and rock cobbles — roughly 100 cubic yards worth. 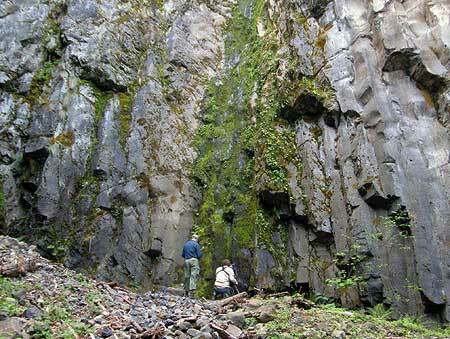 Once the tunnel “cavity” is filled, the vault at the top of the falls would be filled with basalt columns, using the same method described in the “cork” scenario. 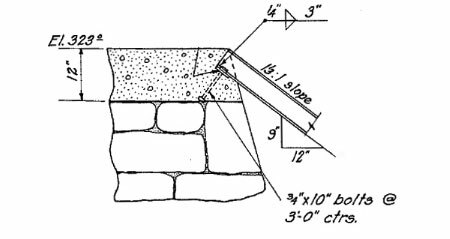 In this case, they could be mortared in place, since this approach would already have concrete pouring equipment on site. 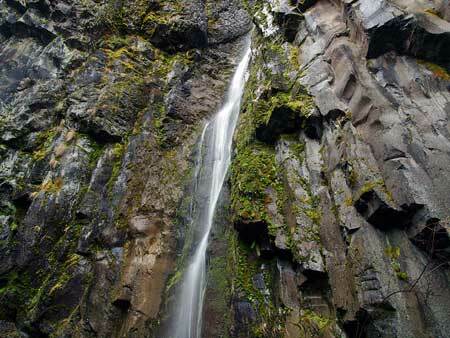 The “dental work” option has the benefit of stabilizing basalt cliffs that form the western wall of Warren Falls by permanently filling the man-made cavity behind them. 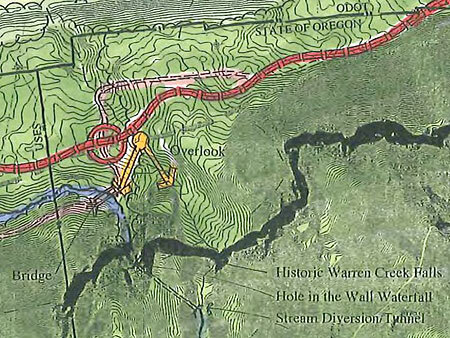 This option allows ODOT to walk away from the Warren Tunnel site forever, with almost no trace of the old stream diversion left behind. 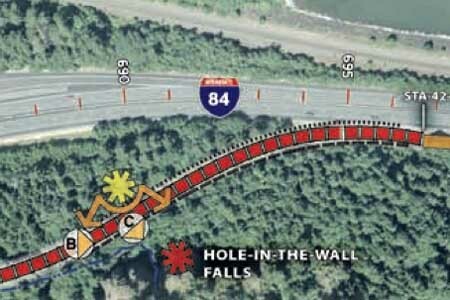 How would ODOT move the concrete and rock to the top of the falls? 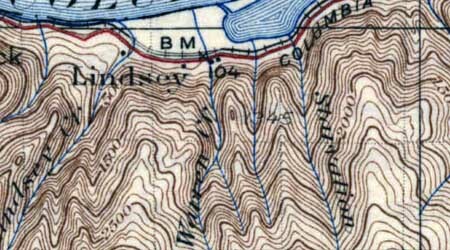 Fortunately, much has changed since the tunnel was originally created, and today there is portable equipment specifically designed for the task. First up is a truck-mounted concrete pump, normally used for precision pouring in building construction, but increasingly used to minimize environmental impacts at construction sites. Moving rock to the top of the falls would be a bit more cumbersome, but could employ a portable rock conveyor. 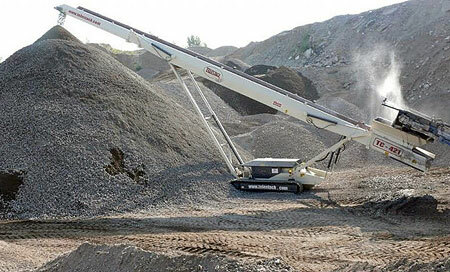 These are widely used in commercial aggregate operations, and could conceivably be used at the Warren Falls site. 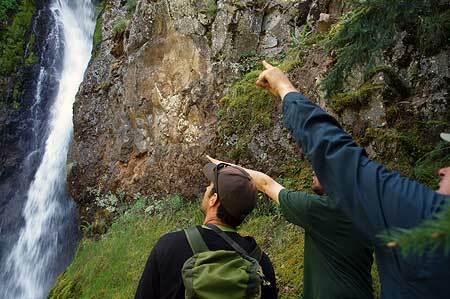 A low-budget alternative is to us rock from Warren Creek’s streambed above the falls. Moving heavy equipment to the site would drive up the cost of restoring Warren Falls, so the “dental work” option for completely decommissioning the old tunnel is probably the least viable alternative, given funding constraints. But it’s also possible that ODOT will already have equipment required to do the job in the area as part of the project to restore the historic highway. 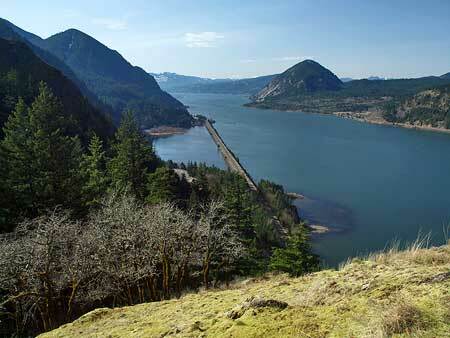 Why link restoration of Warren Falls to the Historic Columbia River Highway project? The answer lies in the intertwined history of the falls and the highway department: now is the time for ODOT to undo an unfortunate environmental travesty from another era. 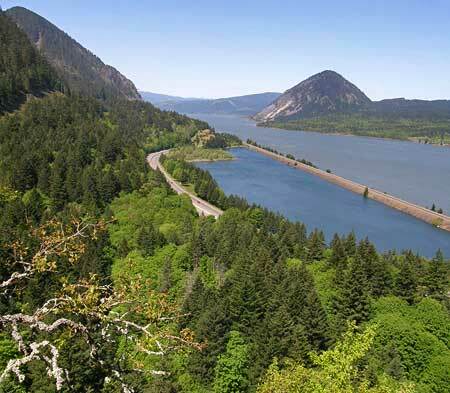 The historic Columbia River Highway restoration project provides a once-in-a-lifetime opportunity to provide the resources needed to restore the falls. It also allows ODOT to demonstrate how much highway planning has evolved since the diversion project was conceived, more than 70 years ago. 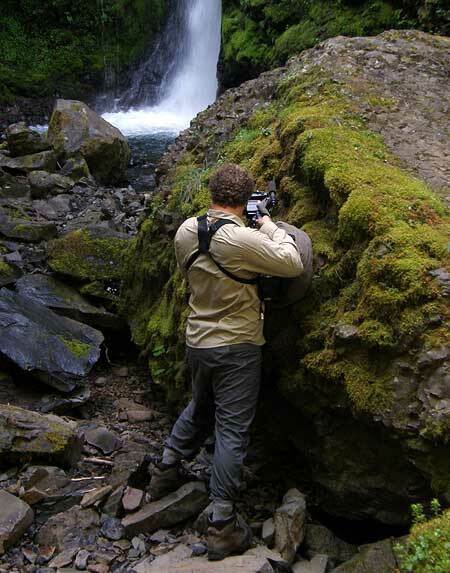 I will be making another pitch to restore Warren Falls at the Historic Columbia River Highway advisory committee meeting on March 16 (in Hood River). Hopefully, I’ll be able to capture the imagination of the citizens and ODOT staff charged with returning the old highway to its former glory, and make the case that restoring Warren Falls ought to be part of the larger restoration effort. As an update to this recent article on restoring Warren Falls, I made a trip to the site of the former falls during a classic “pineapple express” pattern of winter monsoons earlier this month. I was thrilled to find a small amount of Warren Creek cresting the weir that has diverted the creek into a bypass tunnel for the past 75 years, and pouring over the falls. It was remarkable to be in the amphitheater with water cascading over the escarpment, once again, and even if only temporarily. The small amount making its way over the brink completely changed the place from an eerie, somber cavern to a bright, sparkling glen. It was even more exciting to imagine the full force of Warren Creek plunging over the high cliffs, given the thundering display at Hole-in-the-Wall Falls (which is created by the bypass tunnel). 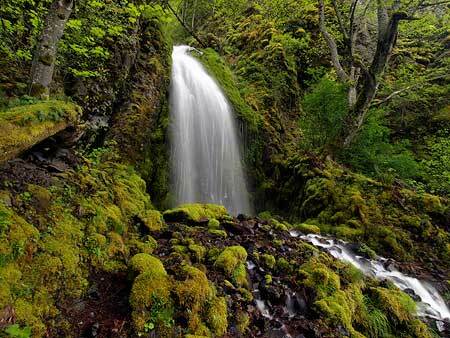 Until the 1930s, Warren Creek was much like it’s neighbors to the east and west in the Columbia River Gorge, plunging in a spectacular waterfall as it reached the final wall of cliffs lining the river. 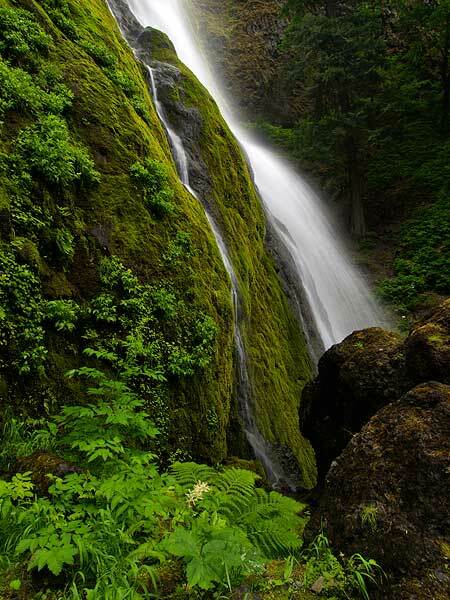 For millennia, the stream had slowly carved a huge amphitheater in sheer basalt, thundering into a deep splash pool at the base of the cliffs, before rushing to the Columbia. 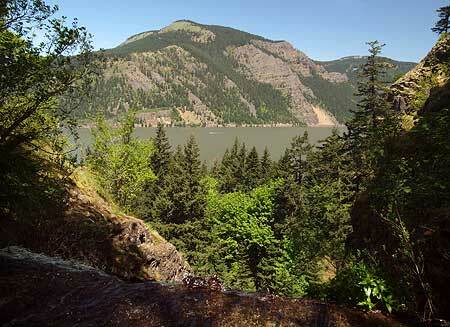 The railroads crossed Warren Creek in the late 1800s, and by the 1920s, Samuel Lancaster’s iconic Historic Columbia River Highway had been constructed, and passed the stream near the falls. 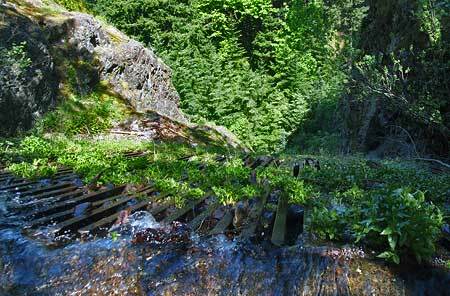 Sometime in the late 1930s, the Oregon Highway Department determined that Warren Creek posed a risk to the highway grade, and made the improbable decision to re-route the falls through a tunnel, depositing the stream a few hundred yards to the west. 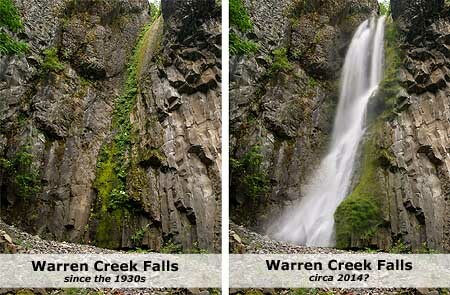 The legacy of this bizarre project is man-made waterfall now known as Hole-in-the-Wall Falls, for the fact that Warren Creek continues to burst out of the diversion tunnel blasted in the 1930s. 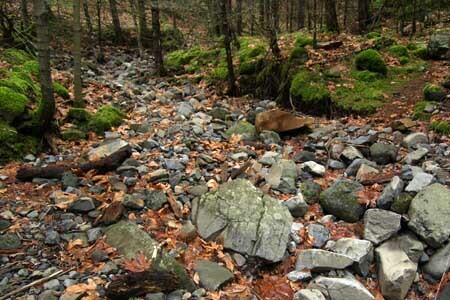 The true falls are still “upstream”, so to speak — the streambed of Warren Creek above the man-made diversion is now dry, though it looks to have flowed yesterday. 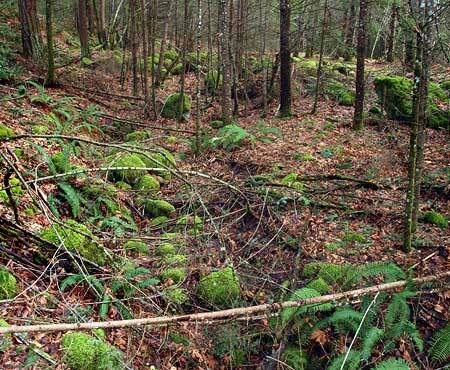 At the head of the dry streambed, the former Warren Creek Falls also looks as if it flowed recently, even though the diversion has been in place for more than 70 years. 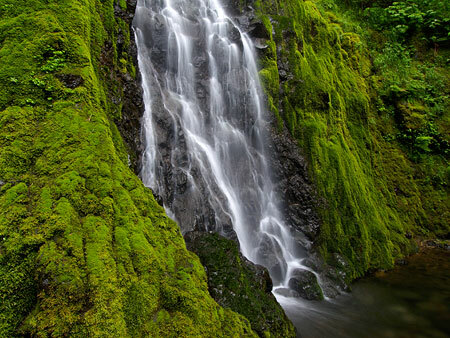 A bright green ribbon of moss and ferns traces the graceful chute where a horsetail-shaped falls once roared down the cliffs. A huge mound of debris has since accumulated at the base of the falls, perhaps from occasional overflows of the weir above the falls that normally directs the stream flow to the diversion tunnel. Someday, a natural storm or geologic event will surely block the tunnel, or destroy the weir, and Warren Creek Falls will once again flow through its magnificent grotto. But why wait? What better statement of our dedication to healing the misguided scars of the human past than to bring back this lovely waterfall? The benefits would be many. First, the natural setting of the falls is unique and spectacular, and would become an instant destination for hikers and waterfall lovers. 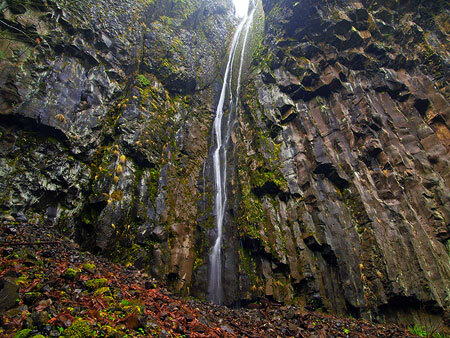 Though there are hundreds of waterfalls pouring over basalt cliffs in the Gorge, the basalt columns at Warren Creek Falls are especially dramatic. 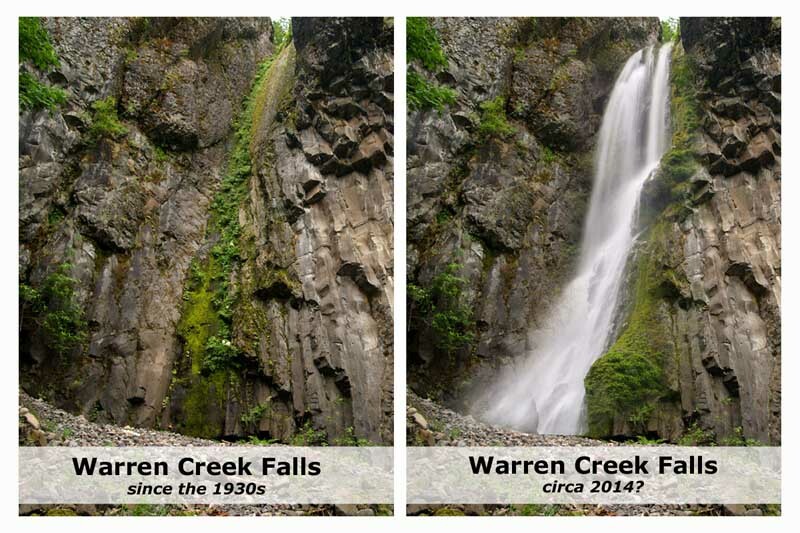 Restoring the falls would also add back several hundred yards of salmon and steelhead habitat, since Warren Creek flows directly from the falls site to the Columbia. The project could also serve a preventive purpose, since the long-term impact of introducing water to the bypass tunnel may be undermining the stability of the huge cliff face that it passes behind. 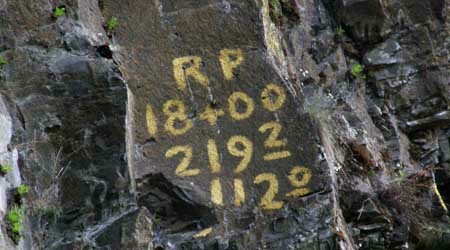 Already, there are signs of spalling rock on the cliffs near the tunnel, suggesting that the diversion is having an impact on the structural integrity of the cliff. Decommissioning the tunnel could at least arrest this impact. As fanciful as this project seems to be in a time of tight public budgets, there happens to be a once-in-a-generation opportunity to link the restoration project to a nearby transportation improvement. 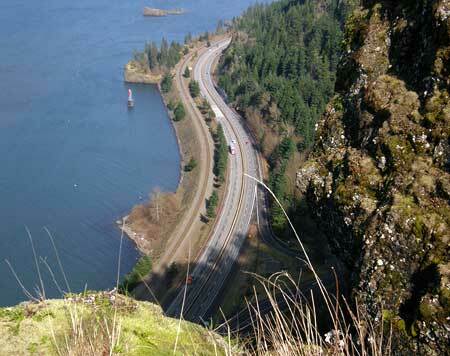 According to tentative plans for the Historic Columbia River Highway (HCRC) project, the segment of old highway that passes in front of the falls will soon be restored and reopened as a bikeway and pedestrian path, similar to other sections that have been restored over the past two decades. There is perfect symmetry to linking the waterfall restoration to the reopening of the highway, since it was the highway that led to the demise of the falls. This symbolism is important as a statement of healing and environmental justice. 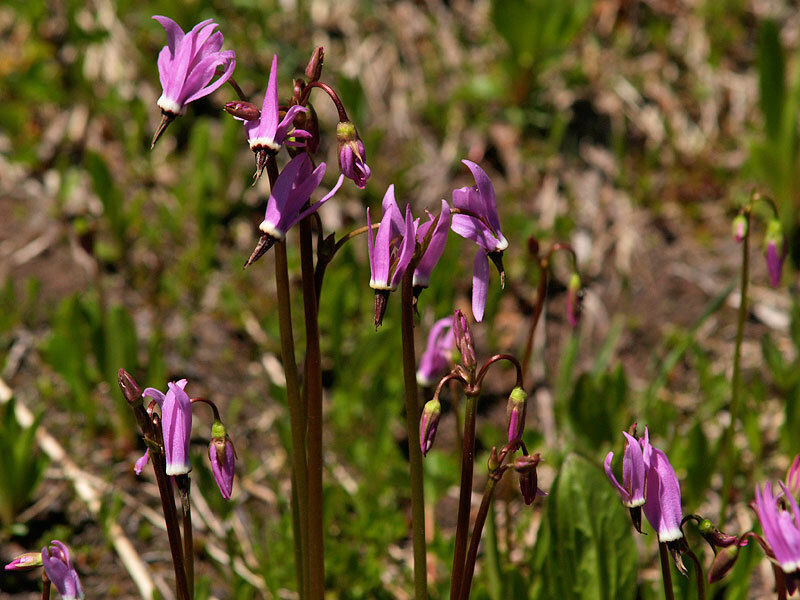 Therefore the project planning should include not only the planners, scientists, architects and engineers needed to design the effort, but also Native Americans representing the countless generations of native peoples who likely visited this spot over the millennia, and perhaps considered it to be of spiritual significance. 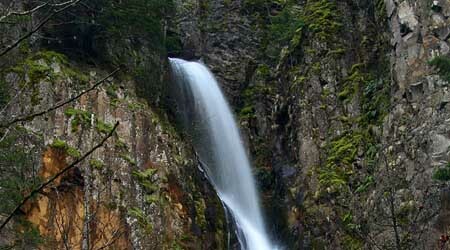 How would restoration of Warren Creek Falls work? 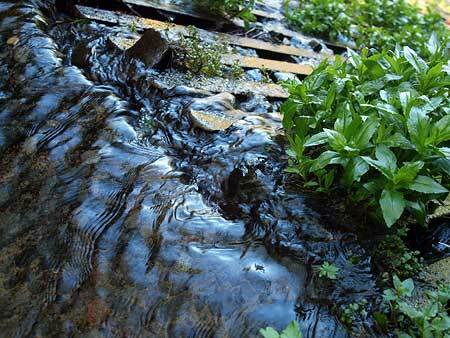 The first task would be to prepare the dry stream bed for the return of an energetic, flowing stream. 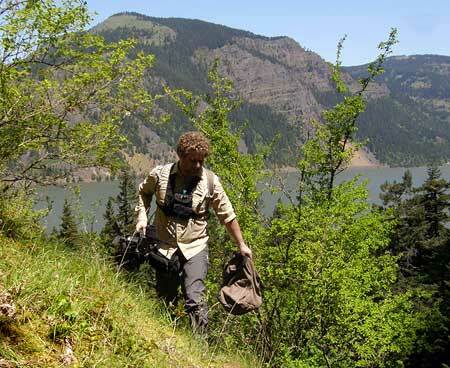 Warren Creek is fed year-round by snowmelt from the high slopes of Mount Defiance, and the dry streambed provides a perfect opportunity to engineer an ideal salmon and steelhead habit. Next, the crowded thicket of young Douglas fir that has colonized the spray slope of the splash pool, near the falls, would need to be thinned and prepared to grow into a healthy stand, perhaps someday framing the falls. There is also a fair amount of English ivy in the area (dating back to the roadhouses and homesteads that once dotted the old highway) that must be pulled, and this would make for an ideal volunteer project. 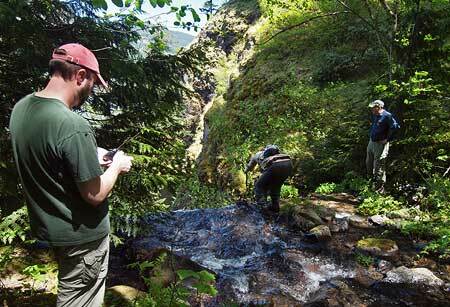 Likewise, groups like Trailkeepers of Oregon could design and build the short footpath needed to take visitors from the old highway to the base of the newly restored falls. Finally, the stream diversion at the top of the falls would need to be dismantled. Blocking the diversion tunnel is straightforward – the tunnel is only about five feet in diameter, and could be filled with natural stone or a manufactured plug. 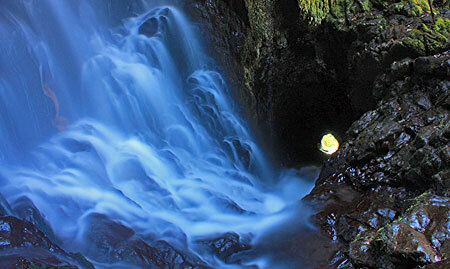 The weir at the top would also be removed, allowing the stream to flow into its natural course, and over the falls. What would become of the man-made Hole-in-the-Wall Falls? 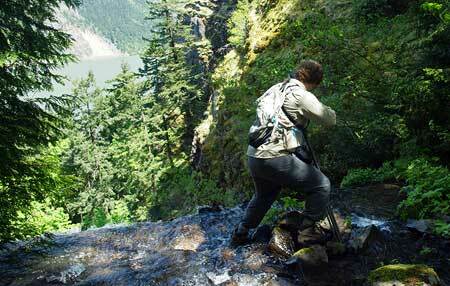 It would be reduced to a mossy spot on the cliffs, much like Warren Creek Falls is today. But interpretive signage along the adjacent trails could simply point to this curiosity as a symbol of humanity’s hubris, and an earlier time when engineers moved inconvenient waterfalls simply because they could. This should be an easy project to accomplish, but unlike those bold days of the 1930s, when an engineer could simply decide to move a waterfall, modern times call for more planning and preparation. The HCRH project provides the perfect venue for accomplishing the planning and for funding the project. However, it will require ODOT to be creative, and involve other state and federal agencies that can help with the project details. But with some ingenuity and dedication, it is quite possible that the falls could be flowing again by 2014, the centennial celebration of Samuel Lancaster’s spectacular road. It’s hard to imagine a better tribute to Lancaster’s original vision than to restore a falls that he specifically had in mind when he designed this section of his elegant highway. 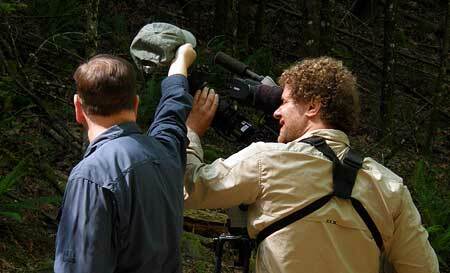 It’s fun and interesting to visit the dry Warren Creek Falls. 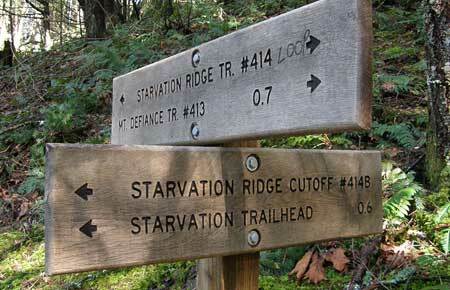 Simply follow I—84 to the Starvation Creek State Park exit, park at the rest area, then follow the trail signs pointing west to the Starvation Ridge Trail. 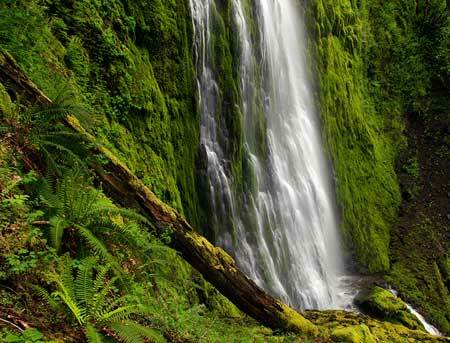 The route briefly follows noisy I-84, then ducks into the trees, following the moss-covered surface of the old highway past Cabin Creek Falls, a tall, wispy cascade framed by house-sized boulders. 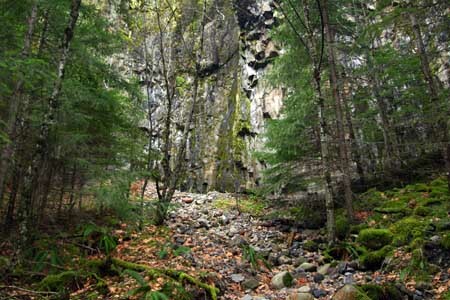 A short distance beyond Cabin Creek, the route becomes a forest trail, soon arriving at the bridge over Warren Creek at the half-mile mark, at the base of Hole-in-the-Wall Falls. Look to the left before crossing the bridge, and you will see the dry former stream bed of Warren Creek coming around a bend. 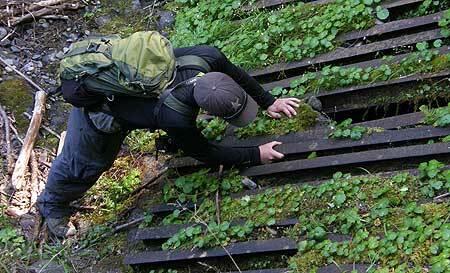 Simply follow the old stream bed for 200 yards to the massive, hauntingly quiet amphitheater of the former falls. Look closely, and you’ll see markings on the cliff that date back to the construction work on the bypass tunnel that passes behind this cliff. You can extend your hike another half mile to Lancaster Falls by continuing over the bridge, then uphill to a T-junction: go right for a short distance to reach the bottom tier of this very tall falls, named for Thomas Lancaster. 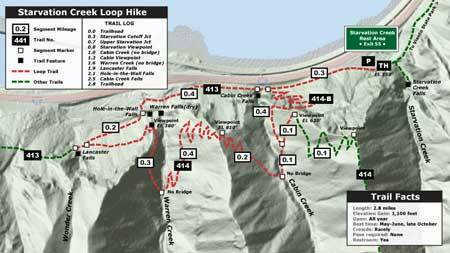 For still more hiking, you can retrace your steps to the T-junction, then continue about one-half mile east and uphill on the Starvation Ridge Trail to Warren Creek. 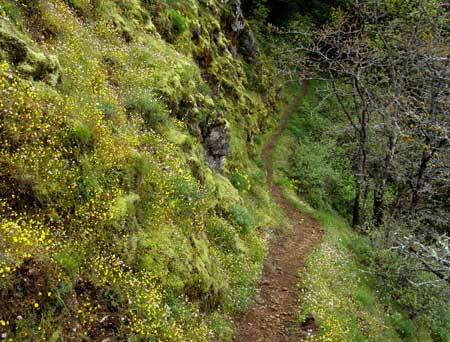 You’ll pass scenic cliffs and viewpoints along the way, and the bridge-less trail crossing at Warren Creek makes for a pleasant lunch spot.